Although GrowPop Deluxe is optimized for all iOS devices past iPhone 5 and iPad 3, it is best played on iPads. This isn’t due to any graphic performance or concerns but simply because having a bigger screen makes it easy to complete the puzzles in GrowPop Deluxe. The puzzle mechanism of this game is simple enough. 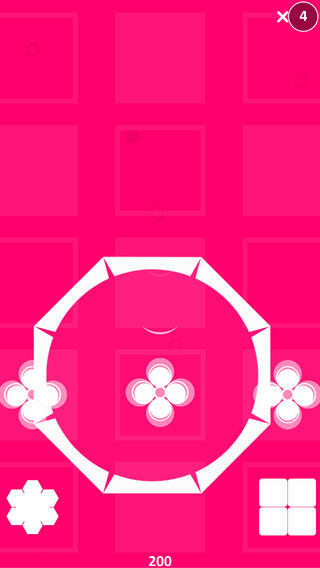 Tap anywhere on the screen to grow a round shape which should then touch two or three other matching objects. After your growing shape touches matching objects, let go of the screen to earn points and make those objects disappear. If you don’t pop objects quickly enough after they have fallen down from the top of the screen, they will remain on the screen but become inactive and un-poppable. Only once you have popped three matching objects will you be able to make the matching inactive objects poppable again. Once you pop these three or four square objects, the other square inactive objects will become poppable again. Popping objects earns points. Letting all of the objects go inactive and reach the top of the screen ends the game. Like I said, this game is simple enough to get into and enjoy. This game successfully brings a new type of puzzles to iOS. I can’t imagine how the developer came up with the idea but I’m glad he did. GrowPop Deluxe could be improved by being able to challenge a friend to beat your high score. Being able to change the background color would also be nice.